For the record, healthy eating is NOT the theme on Relishing It this week. Don’t worry, I’ll return with several wonderful recipes next week loaded with seasonal produce. But not this week. For now, let’s just enjoy these fantastic sticky buns from earlier, and today’s ridiculously good mini-burgers. I am a bit of a burger connoisseur. I know, I know. I say that about a lot of things. But the fact is, if there’s a dish I like, I try as many versions of it as I can. It’s almost as if I need to approach it from every angle. For burgers, I have my favorite combinations. I enjoy the fancy ones with melted brie cheese just as much as I enjoy the not-so-classic with swiss and sauerkraut (which is incredible, by the way). And the classic thick piece of raw onion on a plain burger with ketchup and mustard is heavenly. I could go on and on. 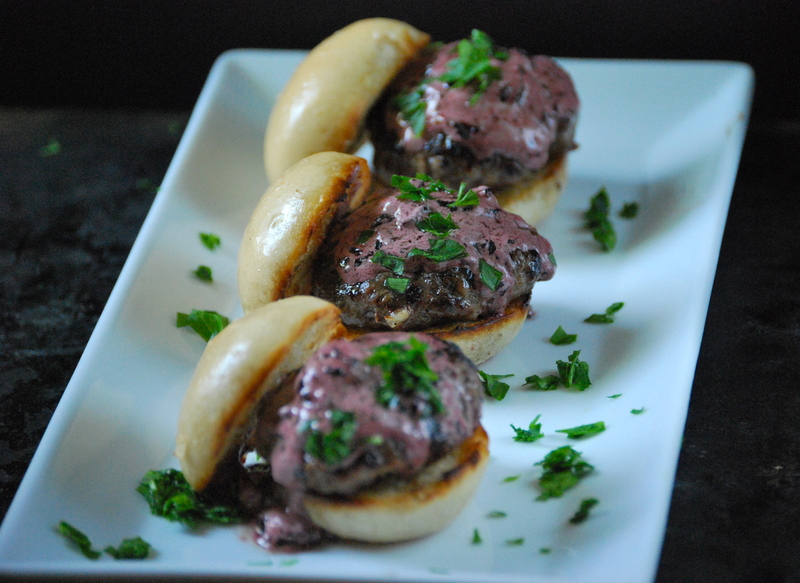 These mini-burgers (I have a hard time calling them ‘sliders’, because it just reminds me of White Castle) with red wine shallot butter are one of my favorite glammed-up ways to eat a burger. They are, quite simply, amazing. More like, over-the-top amazing. I could eat them everyday, but my clothes would not fit within a few weeks. They’re perfect if you’re looking for a show-stopper for a Summer party. You can make everything ahead of time, and once the guests arrive, just pop them on the grill. One of the biggest flavors– and certainly the biggest time consumer– is making the incredible red wine shallot butter. You reduce an entire bottle of red wine with one cup of shallots, for about an hour. Once it’s reduced, you mix this into the whipped butter and chill it. This butter is the key to the whole dish, and it’s so intense that you only need a little pat on your burger. You’ll see in the photos that I tend to add a thicker slice, because I just can’t get enough of the flavor. 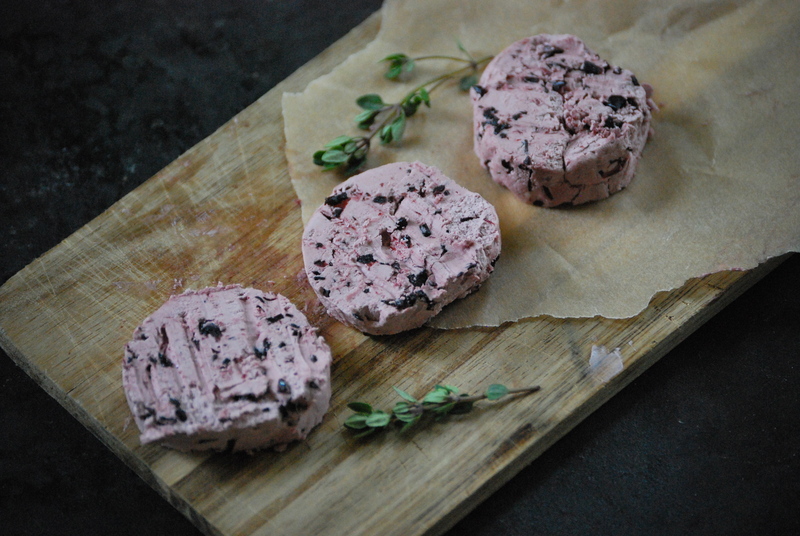 When you make the red wine shallot butter, you’ll end up having some left-over. This is good, because it keeps well in the freezer and can be used later…perhaps on a steak for the weekend? I flavored the grass-fed beef with onions and a fair amount of fresh thyme. The thyme adds a wonderful earthiness and pairs perfectly with the red wine and shallots. And yes, if you’ve looked ahead to the recipe, you’ll see there’s also butter mixed in with the ground beef. It works here, because the grass-fed beef is so lean. Trust me on this, it’s phenomenal. Personally, I like these burgers in mini-form. I made the sourdough buns in the photos, as well. They ended up being a perfect fit. Find whatever small bun you can, or make your own. Just gather some friends and make these burgers, everyone will be happy. 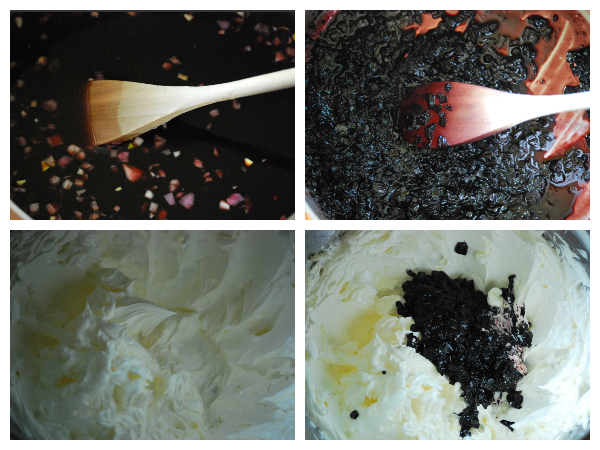 To make the red wine shallot butter: In a large saucepan, combine the shallots, red wine, and sugar. Bring to a boil, then reduce heat to a medium simmer. Continue to reduce for about an hour until the mixture it is somewhat “syrupy”, but almost dry. See photos. Remove from heat and let cool to room temperature. Mix into the whipped butter until homogenous. Use parchment paper or plastic wrap to roll into logs and chill until firm. 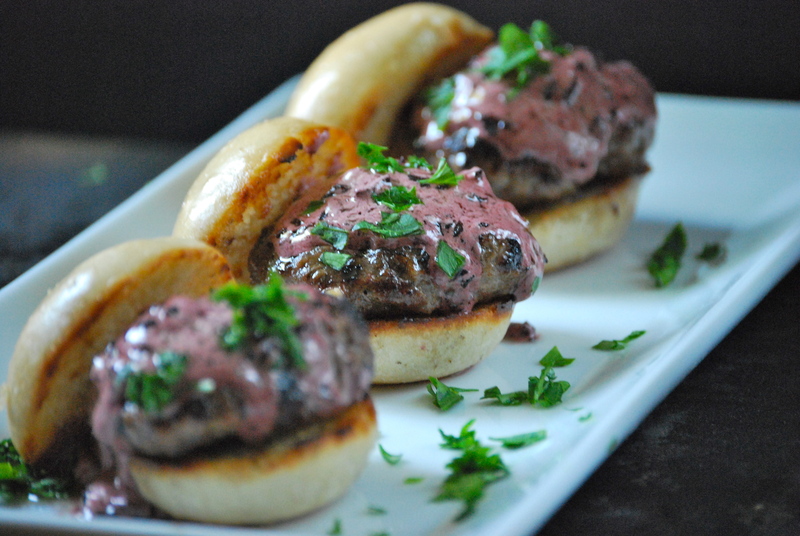 To make the burgers: Remove ground beef from the refrigerator for about 1/2 hour before mixing. It’ll need to warm a bit to properly mix with the butter. In a medium skillet over medium-high heat, add about 2 tablespoons of the butter and the onion. Sweat them until they are translucent. Remove from heat and cool to room temperature. In a large bowl, add the thyme, pepper, egg, salt, and onions. Whip the remaining butter until smooth. Add the butter and ground beef to the bowl and mix until just combined, being careful not to over mix (which can lead to a tough burger). Form into patties and place on waxed paper and chill in the refrigerator for at least an hour. 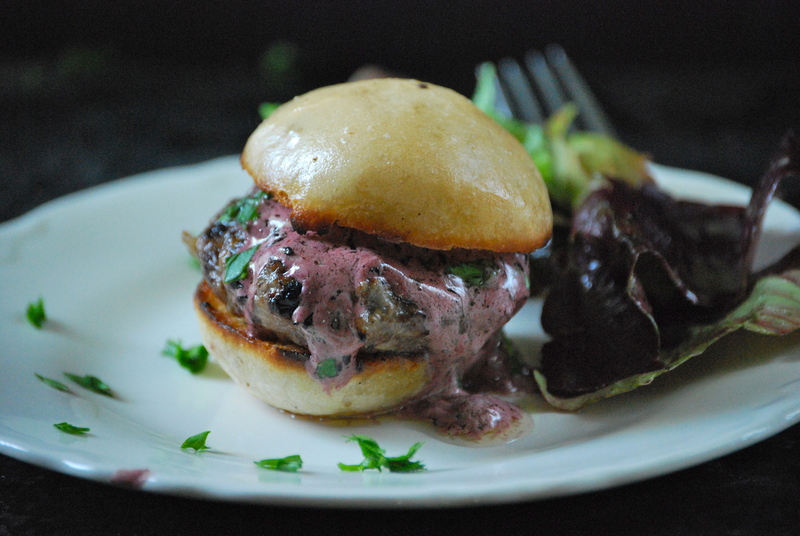 Grill or fry the burgers and top with a slice of the red wine shallot butter and a sprinkle of parsley! Thanks for stopping by Relishing It! Hope you all have a safe and fun holiday weekend! These sound incredible Laurie! I love the idea of that butter on top of the burger, pure delicious decadence! What a wonderful idea! Incredible how something as simple as compound butter can take food to a whole new level! 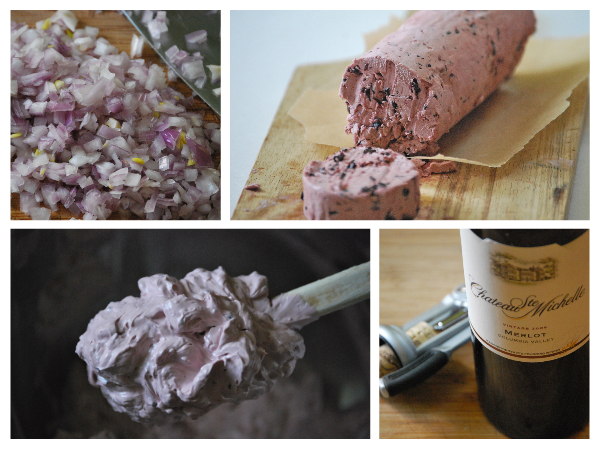 I have the red wine shallot butter pre-made in my fridge. You’re right, my whole house smelled amazing! I’ll be making the burgers VERY soon. I hope you share your bun recipe too! on July 20, 2015 at 4:32 pm | Reply Pesto & Compound Butters..oh my! | Who Eats Like This?